This image depicts people choosing different directions in faith. 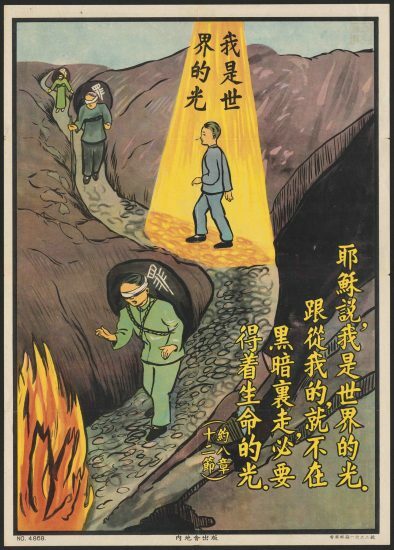 Those who are blindfolded are walking down the mountain towards the flames while the man who can see is walking up the mountain while being surrounded by light. The fire represents hell while the light represents the man being enlightened. All of the people in this image are Chinese. Things that are not shown in this poster are crosses or any symbolism for God or the heavens other than the light shining on the man. The poster seems to focus evenly on the image itself and the text. The art does not seem to have much effort put into it but it does enough to make the image understandable. The message of this poster is that those who don’t believe in Christ are blind and will go to hell, but those who do will be the “light of the world” and ascend to the heavens. This poster is not unusual compared to the others, there are several posters that use mountains to represent those going to heaven or hell. Something surprising about this poster is that the light shines directly on the person climbing the mountain rather than the light shining on the peak. This poster would work in other cultures, since this type of imagery is commonly used by other cultures. This poster may have been effective by using fear. It can also convince someone that they can become a good person by converting to Christianity. A question I have about this is as to why they only depict one person following the Christian path. If they wanted as many people to convert as possible, wouldn’t they show more people as Christian, or at least have someone else following in the enlightened man’s path? In this poster there are several people on one side of an abyss with a bridge across with very few people on the other side. Some of the people are even falling into the abyss. There is a giant red cross at the entrance to the bridge, which probably represents that only people who believe in Christ can pass. The image has a mountain which represents heaven at the top. The abyss represents hell. Chinese commoners are shown in this image. Something that this poster is missing when compared to the others is the bags of sin that the people are carrying on their backs. The bags of sin missing seem to symbolize that those who don’t have them will be forgiven by God. This poster did put heavy detail into its art. Everything in the image is very clear and understandable. 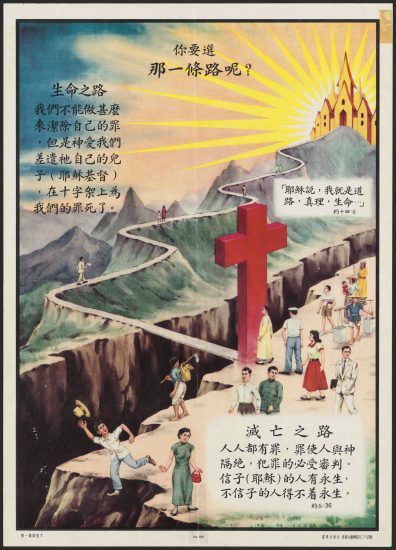 The message of this poster is that anyone can follow the teachings of Christ and go to heaven, but many choose not to, which results in them falling to hell. The text in this image says so. There are many other posters that use similar elements to this one. Something surprising about this photo is that there is a castle at the peak of the mountain rather than there just being a light like many of the other posters. This poster is also a lot more detailed than most of the others. The poster would work in other cultural contexts as this type of imagery is commonly used in Christianity. The poster is effective because it utilizes fear and it also lets the person viewing the poster know that they are capable of being forgiven. Questions I have about the poster are: Why is there a castle on top of the hill rather than the typical light? Why does the cross appear to block its own path? This poster shows people walking up a mountain towards a bright light and others walking down and eventually falling off. There is a giant red cross on the path that leads to the peak of the mountain which represents that only believers of Christ can continue. There is a mountain which represents heaven at its peak. Common Chinese people are shown in this poster. Most of the text on this poster is in the frame rather than in the actual image. The poster also uses are more traditional Chinese looking art style, and there is less detail put into the people and more in the landscape. The message of this poster is that the only correct way to live is the Christian way. The image shows people going down a path that seems right at first but ends in their deaths. Those who follow the path with the cross will survive. This poster is very similar to other posters because it uses the same imagery. Something surprising about this poster is that it seems to use a more traditional art style. This poster could make sense in other cultural contexts because it uses common Christian imagery. The poster is effective because it tells the reader that it is pointless to not follow Christ because you will ultimately fall without following his teachings. This poster seems to have more focus on the text, so a question I have is if it was used in a place where there are more literate and educated Chinese people. I selected these three images because they all represent a similar concept. All three of them show mountains with paths and those who are climbing up the mountains are followers of Christ while those who are going down are not. 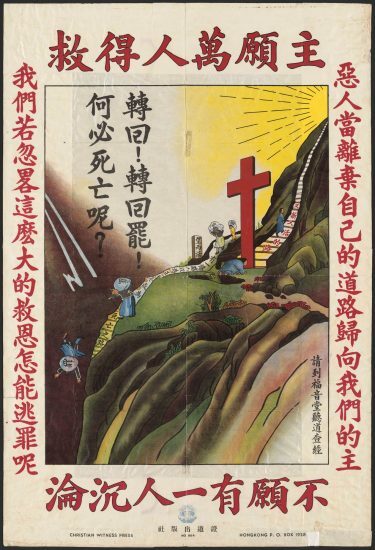 When the three posters are compared, it seems strange that one of them has flames to represent hell and no cross while the other two posters show hell as people falling off of cliffs and there are very large red crosses along the correct path. It is also strange that both believers and non believers travel the same path but in different directions in the first poster while the other two posters show people taking different paths. Why is the first poster different in these ways? If I were an illiterate person seeing these posters for the first time, I would ask about what the imagery represented and specific questions about the message such as: What makes a Christian a good person? and What do Christians believe in that a typical Chinese person doesn’t?